Tagged pets, rats, student life. Yes, this is exactly right, great advice to anyone considering getting a pet of any kind and should be required reading! Personally I would absolutely love to get a dog – it’s something I’ve considered for many years and am unlikely to change my mind, I have a reasonable amount of experience with pets, I have enough money for insurance/vet care, I work mainly from home so would be around in the day … but the last two things at least are liable to change in a couple of years when I finish my PhD and will no longer have guaranteed income and will be looking for jobs/postdocs/whatever all around the country. The point, as you say, is that dogs and cats are a significant long term commitment, and if I know that my life is likely (hopefully) to go through a big upheaval within the next five years, I cannot justify getting a pet like that, much as I would love one. Any pet is a responsibility – my rats have had a couple of health problems and racked up some fairly pricey vet bills in the last year or so. I also waited until I had a car before I bought them in the first place so that I would be able to take them to the vets easily or take them with me if we go to stay with family for a long weekend or something (doesn’t happen often but we did do that over Christmas). Not that I think having a car is a prerequisite necessarily, but you need to think about how you’re going to deal with these things even with small caged pets. And can I just add, your rats are adorable! The rats thank you :) And thank you for your kind words. I’d love to have a dog too but there’s no way my flat is suitable and like you say, the next five years will (hopefully!) involve upheavals and moving around a lot. It’s definitely not something I can consider right now, much as I want to. And yes, rats can rack up some expensive bills! I researched vets in my area before getting them and the vets I use are small animal specialists, have experience in rat care and surgery and are on a convenient bus route. I have a cage set up at my parents’ house so I can take them on the train in a carrier – I’ve even navigated the tube with rats. It’s required thought, and if various factors didn’t align (space, housemates, pet-friendly landlords, transport, vet care, holiday cage) I wouldn’t have got them in the first place. One day we shall have our dogs! A retired greyhound is my dream dog. The other issue I find with rats is that it’s harder to find people to look after them if you go on holiday – I’ve had many hamsters in the past and friends have always been very happy to look after them for a few days. 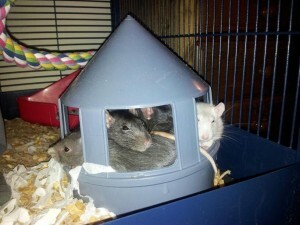 For some reason, they are not as keen with the rats, especially with handling them. Poor little things, they do still get such a bad rap! In my experience you are actually much more likely to be bitten by a grumpy hamster than a curious rat. Luckily (?) we don’t really go on holiday. Same! I’d like to find a greyhound that didn’t have enough chase instinct to compete – basically, I want to find the most useless dog in the entire history of sighthounds. Rats are unfairly maligned. My worst bite has been from a rabbit and I’ve only had one grumpy rat. You’re more likely to get licked to death by my lot than bitten. Indeed, Bramble seems convinced that she’s the only thing standing between me and a total breakdown of personal hygiene. Are you on http://fancyratsforum.co.uk? That’s quite useful for finding rat sitters.